Art, through its various forms, has always stressed on the significance of aesthetics and expression. Unlike most mediums, visual forms, including photography, tend to be more direct—impressions received in minutes, and seconds. Visuals often hinge on relevance, arousing emotions, wonder or despair, affection or bitterness, clarity or confusion, joy or horror. In certain cases, the context of a project might not be relevant to the masses at large. However, in other cases, the content becomes the sole basis for the viewer to interact with the piece. 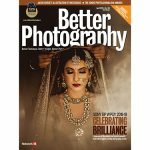 Better Photography introduces 11 diverse artists, set to exhibit at the Chennai Photo Biennale, to take place from 22 February to 24 March. The theme for this edition is Fauna of Mirrors, an ancient Chinese myth, which photography embodies and manifests today. One can’t help but notice that the art in these pages are with purpose, mirroring the world at large. Some of these works have taken years to develop, with their creators fighting against the odds of time, money, and permissions, in achieving its vision. The stories you see here may offer a glimpse into the seminal works of their makers, but visiting the Biennale will let you experience the expanse of their meaning, the way they are meant to be displayed and viewed. 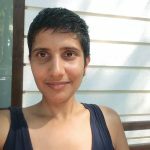 Nilofer Khan takes you through the works of these 11 artists… Anna Fox, Tejal Shah, Arjun Vijai Mathavan, Archana Hande, Cop Shiva, Catherine Leutenegger, Karthik Subramanian, Chan-Hyo Bae, Arpan Mukherjee, Manjunath Kamat, and Nandini Valli Muthiah. All images by Anna Fox, in collaboration with Alison Goldfrapp. Image courtesy: Tasveer Arts, Bengaluru. Untitled, 1997. In collaboration with singer and performance artist Alison Goldfrapp, Anna Fox’s Country Girls portrays a dark tale that grew out of concern, after experiencing the serious issue of violence against women in Alton, a town in rural southern England. The series focuses on Goldfrapp’s and Fox’s personal encounters, while they were growing up in the town, as well as the gruesome murder of 8-year-old Fanny Adams. 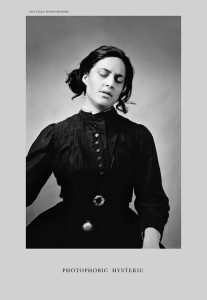 Fanny was chopped into bits by her murderer, a bank clerk, while she was out playing in a local meadow, in 1867. Right after the murder, the Royal Navy introduced tinned meat for the sailors, who absolutely hated it. They began to call it Sweet Fanny Adams, as a macabre joke. The term has stuck around in British parlance, gradually changing to ‘sweet f***all’. In other words, this means ‘absolutely nothing’. 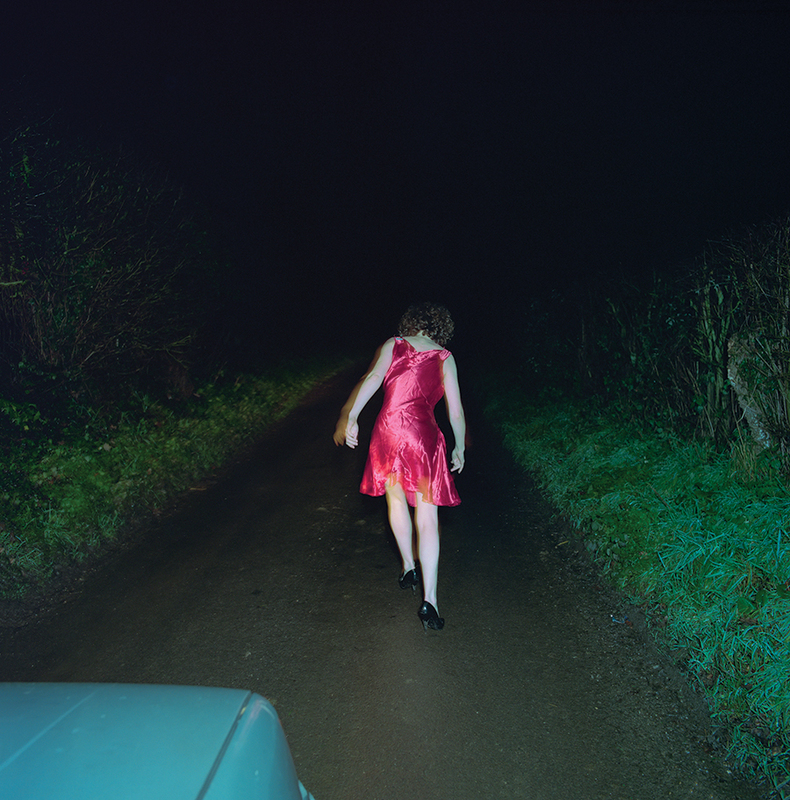 Goldfrapp and Fox were heavily influenced by the story, leading them to create a series of staged images between 1996 to 2001, to narrate how they feel about the attitude of people towards young women in the countryside. Country Girls also draws attention to both the fashion industry and society, in connection to fetishising the female body. 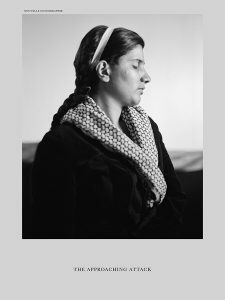 In 2007, during her first international residency in Paris, Tejal Shah was introduced to a book titled Invention of Hysteria: Charcot and the Photographic Iconography of the Salpêtrière by Georges Didi-Huberman. It included photographs of ‘hysterical women’. The images in the book claimed to provide evidence of hysteria, while describing its various nuances. The hospital that enabled this project mapped hysteria only on women’s bodies, emphasising its ‘feminine’ nature, while claiming to create empirical knowledge about it. Moreover, the ‘patients’ consisted of prostitutes, poor women, and those who were considered ‘sexually overactive’. 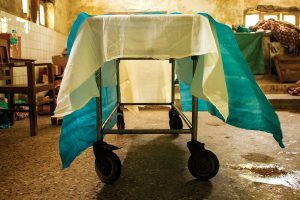 Shah was drawn to Didi-Huberman’s thesis and his critical and feminist analysis of what had happened at the hospital, along with the history of the invention of photography rooted in the colonial-military expansionist projects. Troubled and fascinated by the disturbing representational practices, Shah produced the Hysteria series, in collaboration with dancer and choreographer Marion Perrin, who helped her choreograph the images, to talk about and question the portrayal of women now, and back then. Untitled. 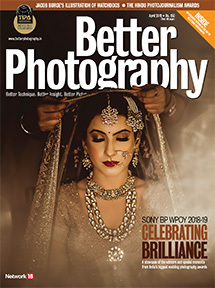 All photographs in this cover story that do not feature captions have been intentionally left untitled by the artists. The oppression of Dalits dates back to the millennia-old story of Nandanar, the only Dalit saint in the Nayanars. 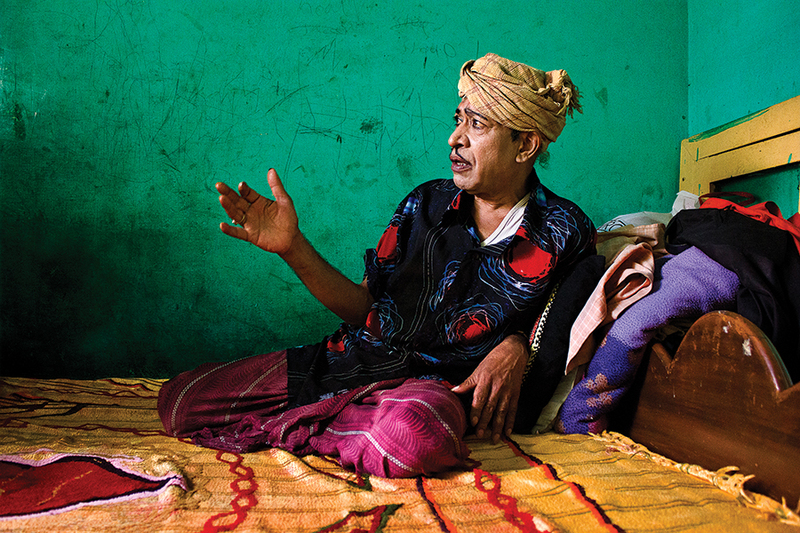 Since then, caste oppression has continued to pervade society, and it has taken various forms. 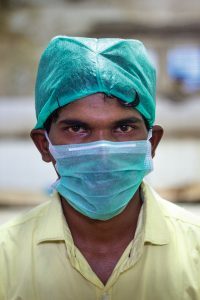 When western medicine was introduced about three centuries ago, it was wholly accepted, without the interference of the caste system. However, this was not true for autopsies. 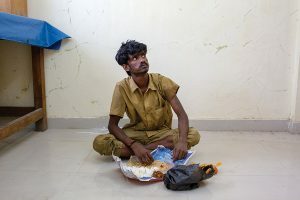 It became the responsibility of Dalits, who were forced to do all the menial jobs. 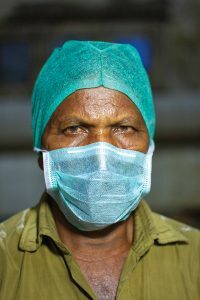 Arun Vijai Mathavan, through his series, Millennia of Oppression, aims to illustrate the exploitation that the community faces at government hospitals, where their ID cards call them sanitary workers. 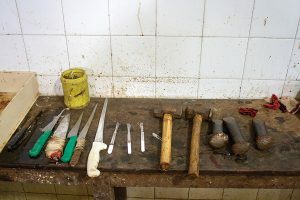 They are forced to conduct the autopsy, including the opening of the torso with the Y-incision. 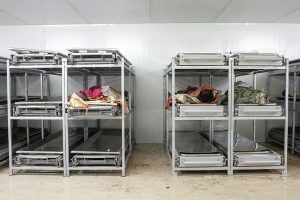 The need for training apart, the ill-equipped workers, with outmoded refrigerators and crude implements, perform their tasks in abysmal conditions. 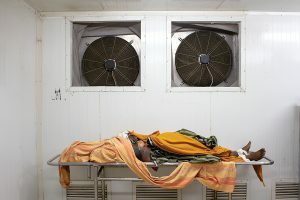 Due to this, they suffer from several occupational ailments and work-related infections from handling decomposed bodies that are often infested with vermin. 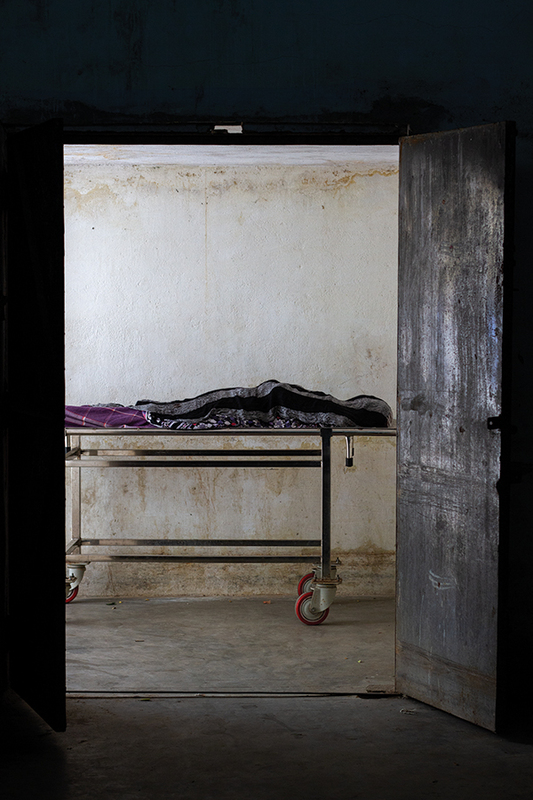 Though their task is to endow dignity to the dead, they end up facing social death themselves. Grossly underpaid, they cannot tell their friends and neighbours what they do for a living. 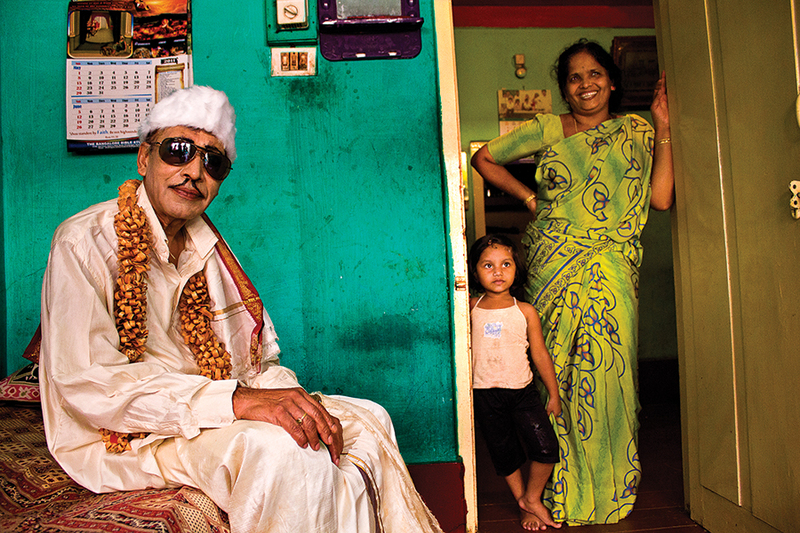 Photographed in Gujarat, what started as Mathavan’s graduation project, eventually extended over the course of a year, and is an important document about caste oppression, as much as it is about the apathetic attitude and ignorance of society. Digital Print, Photomontage. The images of camels and cameleers are from various institutes and personal albums. Archana Hande holds an M.F.A in printmaking from M.S University, Baroda. She has been bestowed with the Charles Wallace India Trust Arts Award. 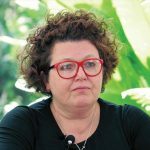 She has also earned a residency in Glasgow School of Arts in 2000, and at Pro Helvetia, Switzerland, in 2010. To view her work, visit www.archanahande.com. 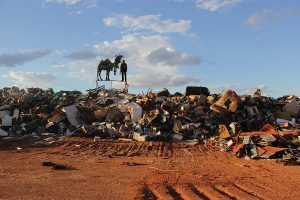 The Golden Feral Trail records local and oral histories to trace the relationship between South Asia and Western Australia. It is a story of trade and migration between the two regions, from the early 1800s until the present. 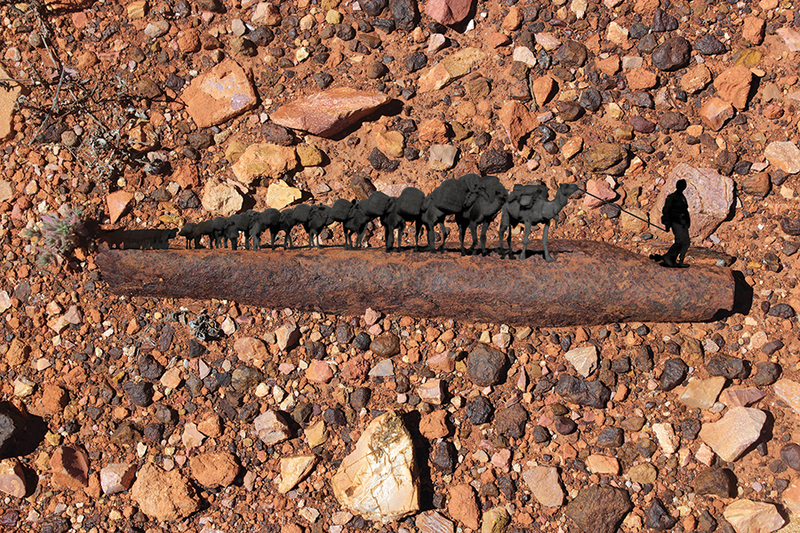 The trail follows the phantoms of Afghan camels and cameleers—who helped the Britishers to find gold fields and build infrastructures in Western Australia—through the abandoned graves, deserted mining pits, ghost towns, institutional archives, and personal photo albums. The term Afghan was loosely used by the Britishers. The Afghans were not from Afghanistan but were immigrants belonging to nomadic sects across Sindh, British India, Afghanistan, or Baluchistan. They also belonged to different religions such as Islam, Sikhism, and Hinduism. Digital Print, Photomontage. The images are from Western Australia Museum, Dwyer collection. 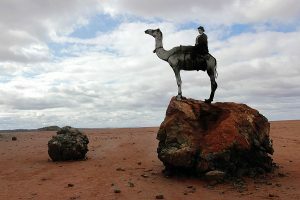 In 2013, Hande received an opportunity to follow the trails of Afghan cameleers, during her residency at the International Art Space, Western Australia. She spent six months in Laverton researching and scripting her story. The final photomontage is a result of her own photography, images from family albums, and photographs from institutional archives. With the camels and the cameleers, she narrates the story of the land, of how the trails came to be, and invites viewers to discover how identities were lost. Her final project also includes an animated video, and displays of various objects found at these places, to provide a sense of time and place. Cop Shiva believes that every person consists of many layers of intertwined personalities. While some are more public, others are invisible. A few remain hidden so deep that there may be no conscious awareness by the person at all. This seems true in Vidyasagar’s case. A Bengaluru resident, he dresses up as Tamil film icon and politician M.G. Ramachandran, each day. Known popularly as MGR, he was an overpowering influence in politics and cinema, in South India. Vidyasagar removed the gap between himself and his favourite personality, and since then, he has become the very image he so adored. 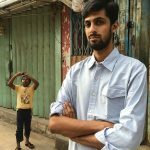 As a documentary photographer, Shiva wants to draw attention to realities that often go unnoticed in society. His focus while shooting I Love MGR was on the manipulation of identity through disguise, and the idea of taking on a new persona. 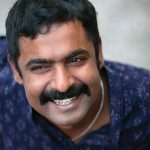 In many ways, the series comments on the prevalent influence of cinema in the socio-cultural context of South India. 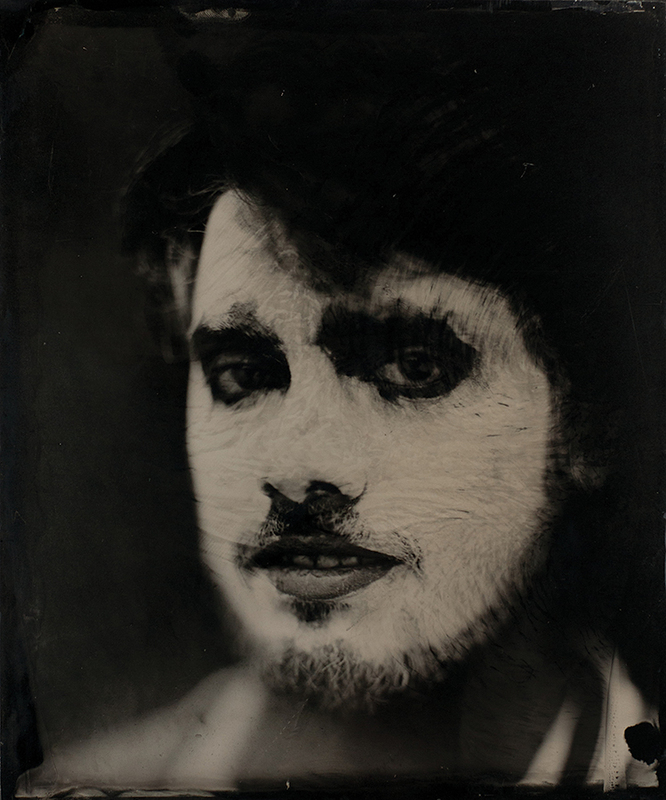 Shiva’s portraits show a man dealing with the polarity between reality and fantasy. The intimate portraits, which were shot in Vidyasagar’s home, also captures the vulnerability, warmth and acceptance of Vidyasagar as MGR. Kodak Hawkeye Building, with Kodak 1971 vintage brand logo, St. Paul Street, 2012. Catherine Leutenegger is a visual artist based in Switzerland. 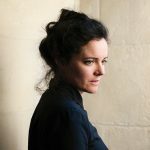 She has studied photography at the École cantonale d’art de Lausanne, in Switzerland, and is the recipient of the Manor Kunstpreis, the Prix de la Fondation Vaudoise pour la Culture 2018, the Raymond Weil International Photography Prize, and the Swiss Design Awards. To view her work, visit www.cleutenegger.com. In the early 2000s, Catherine Leutenegger, an analogue photographer, felt particularly affected by the upheavals that the digital age brought to traditional photography. To analyse this evolution, she began to investigate the medium and the context surrounding its production. 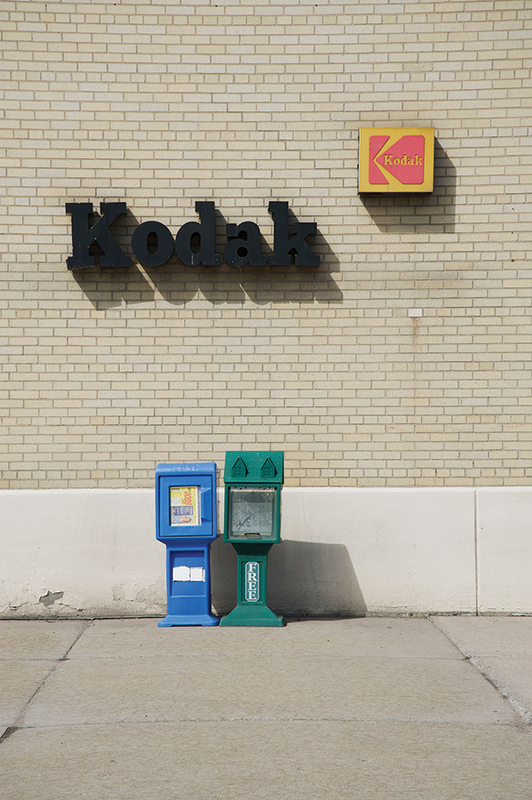 The initial stage of this exploration began at studios and photo labs in western Switzerland, and continued from 2007 to 2012 in New York City and Rochester, NY, where Kodak’s headquarters were established. 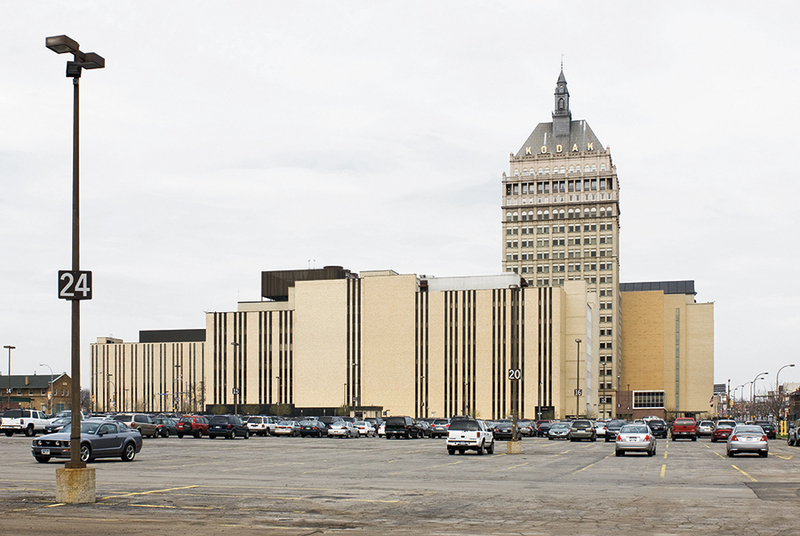 Over the past century, Kodak has gained worldwide reputation and acclaim, but little attention was paid to Rochester, where the first roll of flexible film was invented. Leutenegger was curious to discover the city behind Kodak’s headquarters and its industrial facilities related to film production. Kodak World Headquarters Building, 2007. 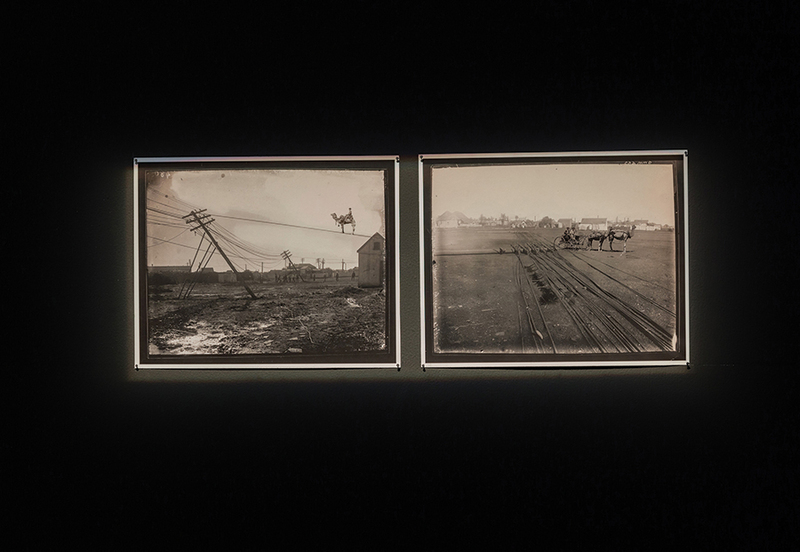 Kodak City, which is also a book, offers a view of a singular moment in the history of photography. It is a testimony that is both engaging and objective, covering a part of America’s industrial heritage that faces inevitable disappearance. It also pays homage to the father of modern photography, George Eastman, Kodak’s founder, in his hometown Rochester, which he transformed into the cradle of the world’s collective memory, for the entire 20th century. In its time, it was among the world’s leading industrial technology centers. Leutenegger’s images are ‘meta-photographic’, inviting reflection upon photography’s past, present, and future. 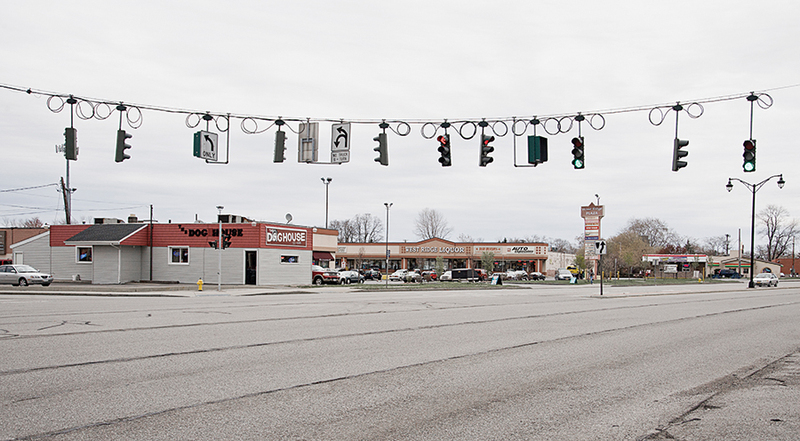 Traffic Lights, West Ridge Road, 2012. Fans of MGR during a re-release of the film Nadodi Mannan (The Vagabond King), 1958, at a theatre in Madurai, Tamil Nadu. 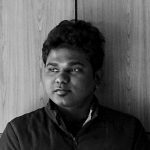 Karthik Subramanian is based out of Chennai, and likes to work on long-term stories. 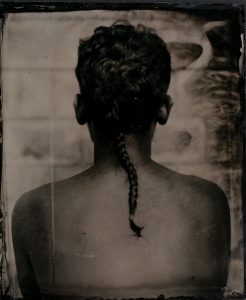 His photography explores the boundaries and doubts that occur between the real and the imagined. 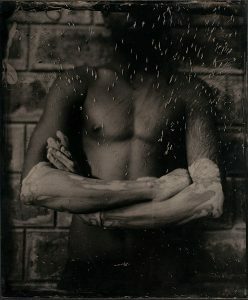 You can view his work on www.karthiksubramanian.com. Looking back at the history of Tamil Nadu, film and politics have gone hand in hand, since the 1950s. From 1967 until today, the state government has been led by personalities from the film industry. 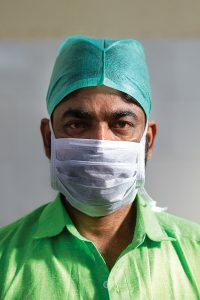 Dr. M.G. Ramachandran, an actor and the founder of the All India Anna Dravida Munnetra Kazhagam party, is the first film star to become the Chief Minister of any state in India. Through his films, he is said to have carefully developed a certain image in the minds of the people, which helped him achieve huge popularity and success in politics, akin to the status of a God. Following his death, the party was taken over by his co-star and political protégé, the late Dr. J.Jayalalitha, who was also Chief Minister. She acted in over 140 films, 28 of which were alongside MGR. 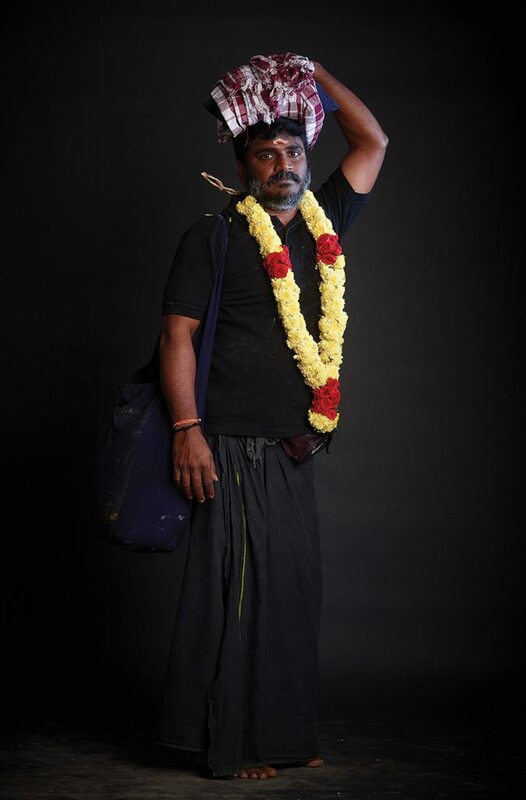 I Swear On My Mother is primarily a video installation that incorporates videos, films, text, Subramanian’s own photography, as well as found images and objects, that together tell the political history of Tamil Nadu, through its popular Chief Ministers. 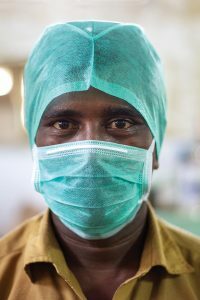 A collection of several un-truths and truths, when curated as a whole, attempts to reveal the real experience of the people in Tamil Nadu. 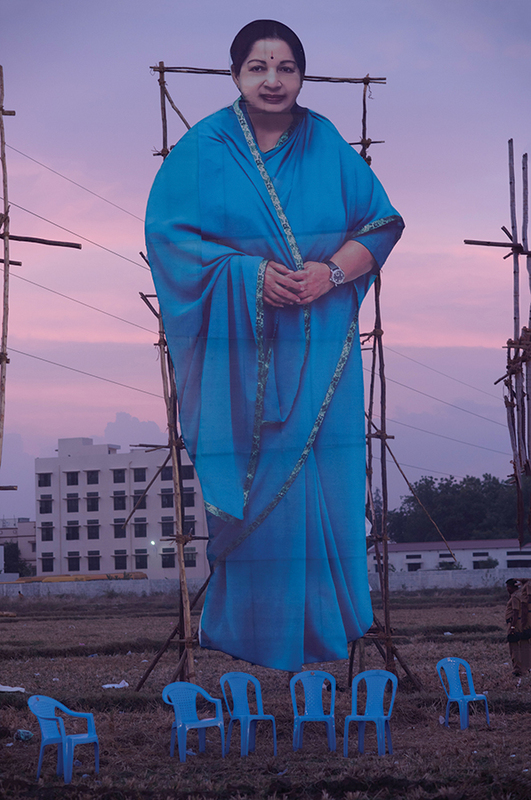 A cutout of J. Jayalalitha put up during an election campaign event in 2016. 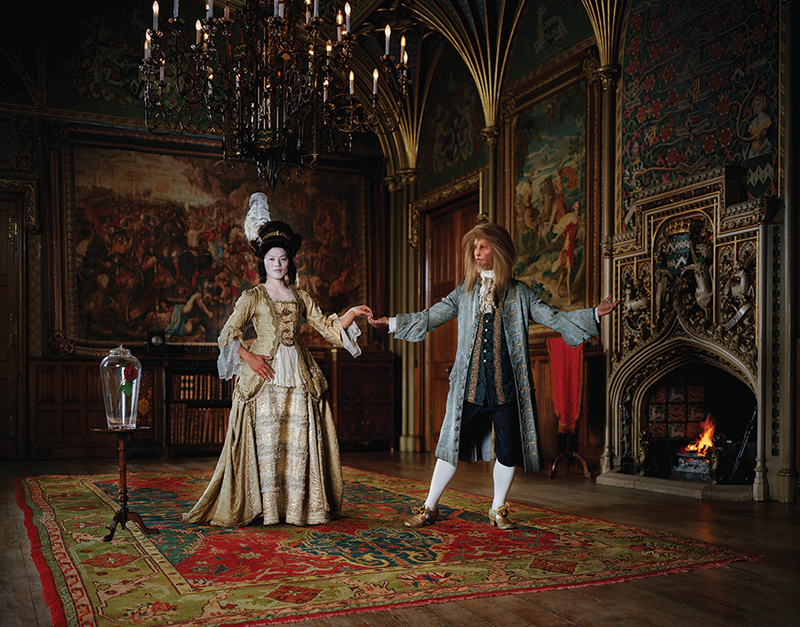 Existing in Costume-Beauty and the Beast, C-Print, 230x180cm, 2009. Chan-Hyo Bae always admired western culture. However, upon reaching the UK, he realised that a large part of everything he conceived existed only in his imagination. He discovered that historical oil paintings and western architecture interested him tremendously. 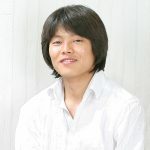 He eventually turned to them in the creation of his own series, Existing in Costume, in which he portrays the fantasies of Asian men within a Western reality. It was also a study of his own feeling of alienation. Despite using near identical styles, the presence of an eastern man in western imagery always appears strangely odd, and it’s difficult for people to accept this change. 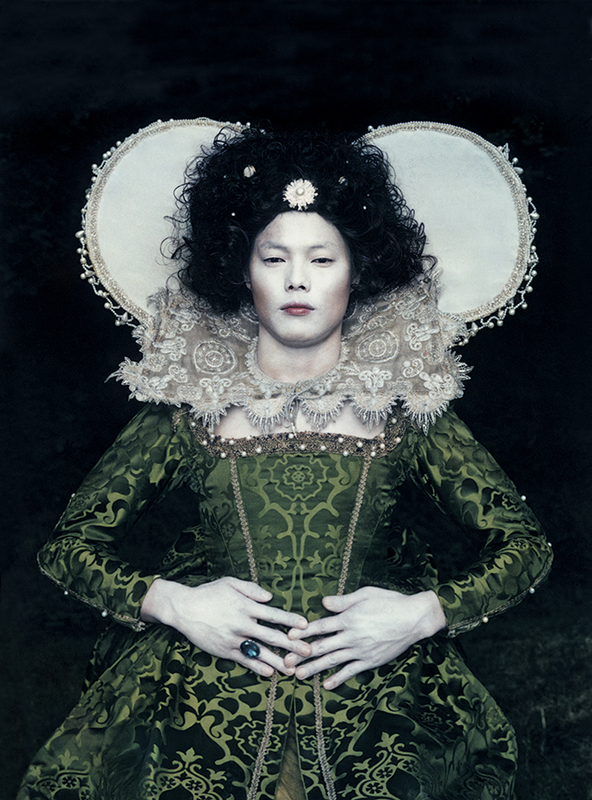 Existing in Costume 1, C-Print, 100x80cm, 2006. He began to further explore the complexities related to stereotypes, gender issues, social class structures, and the problems of legitimising violence on minority groups by dominant groups, and how it is transmitted from generation to generation through social conventions. For this, he looked at popular fairy tales, which he believes share a common point with history, leading readers to accept a fixed conclusion or thought. 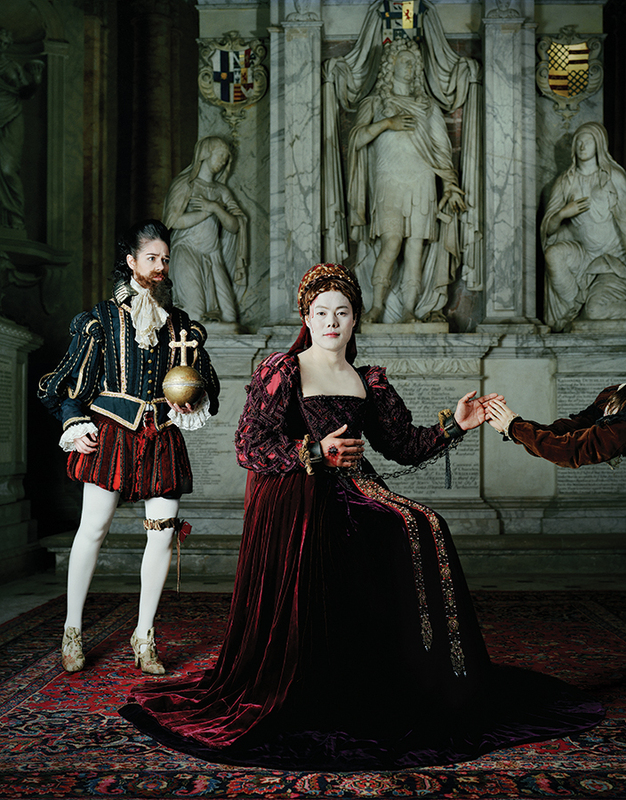 Existing in Costume-Anne Boleyn, C-Print, 230x180cm, 2012. Existing in Costume explores his experience from a first person’s perspective. In his later series, Bae looks at himself through the eyes of others in society, in more detail manner. 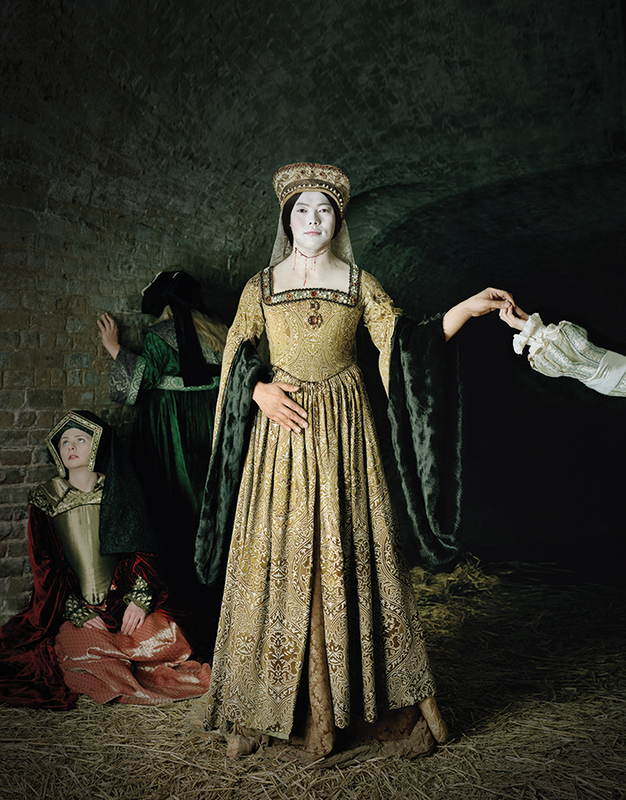 Existing in Costume–Mary Stuart, C-Print, 230x180cm, 2012. Back in 2012, the Economic Times published a report which stated that the market value of a popular bleaching cream, Fair and Lovely, was Rs. 3000 crores. 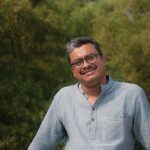 When Arpan Mukherjee saw the alarming statistics, he decided to launch an investigation into the issue. He began to look into the matter when he came across two books, which provided a basis for his work—The Oriental Races and Tribes (1863) and People of India: The Races and Tribes of Hindustan (1868). 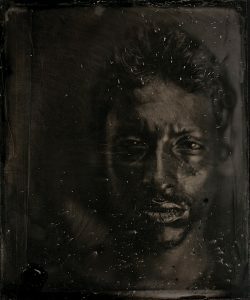 The most fascinating part was the use of wet plate collodion, the photographic process of that era, which is sensitive to blue. 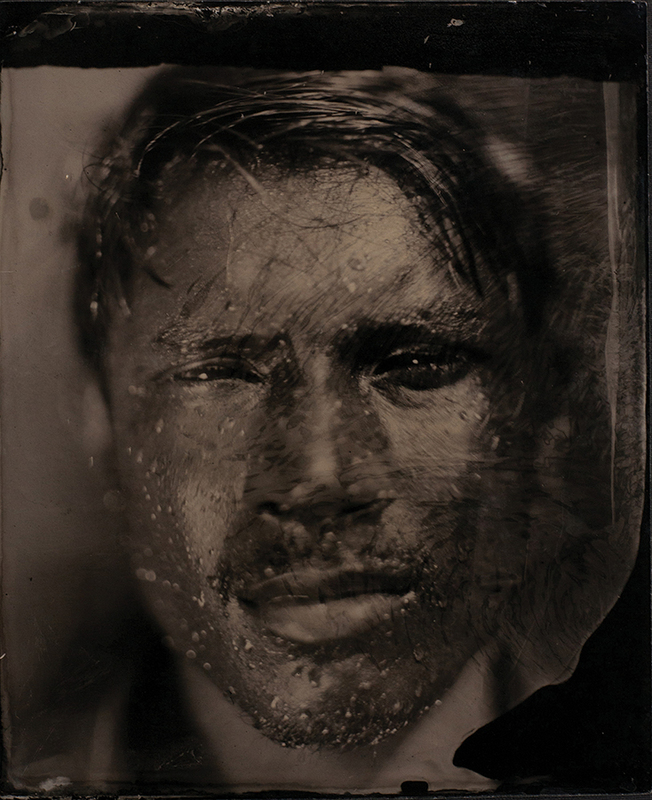 When employing this process to photograph Indians, whose skin tone tends toward yellow, it caused the final photograph to show a much darker skin tone than reality. Later, he shared his findings with his students, to begin a discussion. Coming from various parts of India, the students shared their stories of discrimination, on the basis of their skin. They also mentioned how complexion plays a significant role in terms of power demonstration. 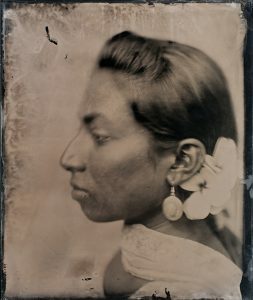 Eventually, his students actively participated in the project, where Mukherjee used the collodion process to mock the age-old norm of beauty. 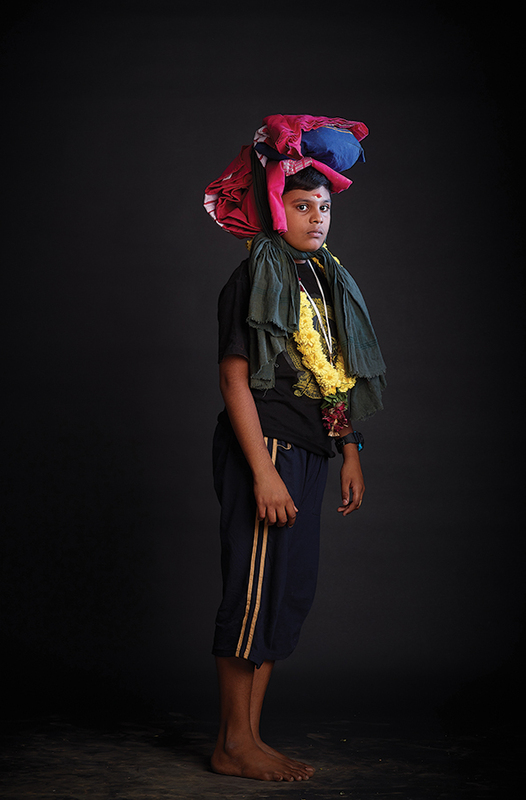 Hayavadana, digital print on archival paper, 60 x 48 inches, 2018. 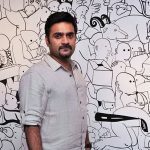 Manjunath Kamat holds a BFA from the Chamarajendra Academy of Visual Arts, Mysore. He earned his first artist residency in 2002, at the School of Art and Design, University of Wales Institute, Cardiff, UK. He has also been bestowed with the Charles Wallace Scholarship, UK, in 1999, and The Raza Samman award, in 2010. You can view his work on his Instagram handle @ bmkamath. 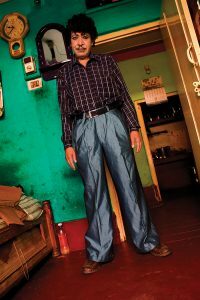 Manjunath Kamat has always held a fascination towards collecting photographs—old prints from different eras, genres, found images, as well as staged photographs shot by him. Later in life, this influenced him greatly, and had led him to work across several mediums. In one of them, he digitally cut, stitched and layered images for newspaper illustrations. 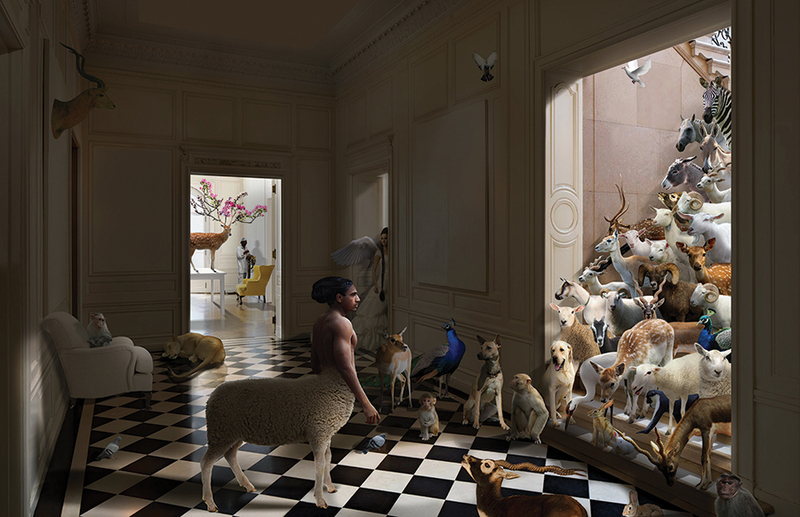 Overdose, digital print on archival paper, 96 x 144 inches, 2009. When he began working on photomontages, his approach towards digital print was from the point of view of a painter. 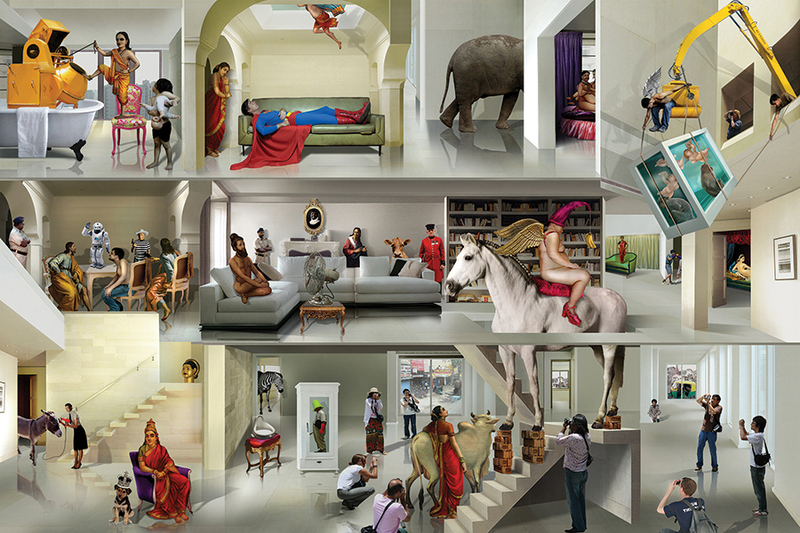 He built his images, layer by layer, moulding each image to develop the characters you see here. They are actors, enacting in a play directed by him, thereby becoming an extension of him. Humour is one of its many facets. 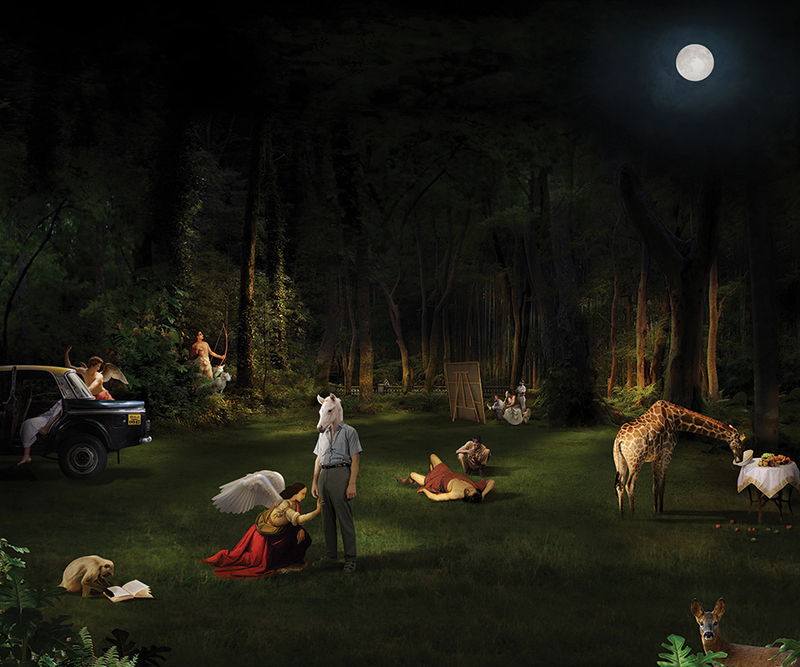 Extended Tale, digital print on archival paper, 60 x 93 inches, 2015. 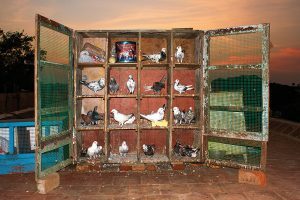 Viewers will notice that everyday mundane images from the streets, as well as from Kamat’s immediate environment, popular culture, fashion, and advertisements, play a vital role in his montages. 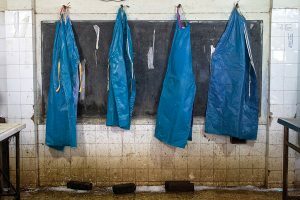 Though the pictures are devoid of context, they do comment on how globalisation has led to a certain kind of homogeneity. 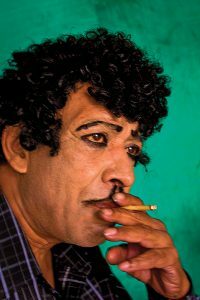 In a way, it is similar to morphing cultural identities and indigenousness, while the characters in the photographs search for their own identity in the global mishmash. 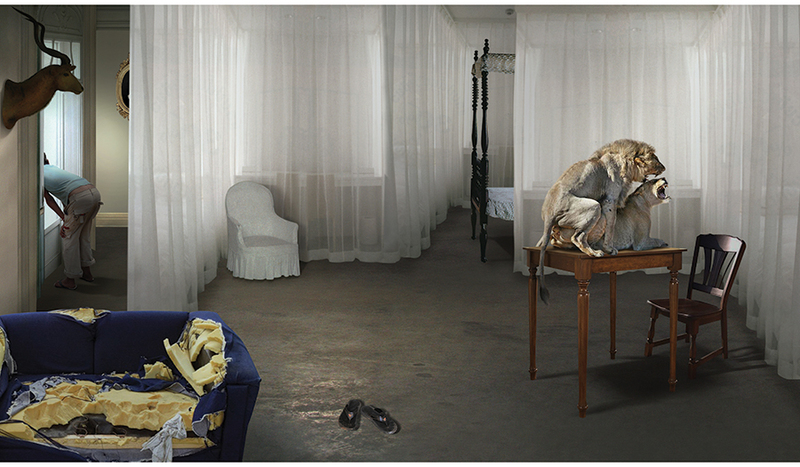 Arranged Situation, digital print on archival paper, 42 x 24 inches, 2011. 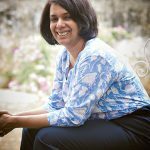 Nandini Valli Muthiah began her journey in 2005. She studied photography at the University of Arts, in England. She draws her inspiration from the mundane and the daily life rituals of those surrounding her. Muthia also received a fellowship grant from the Tierney Foundation, New York. 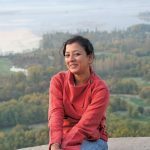 You can view her work on www.sakshigallery.com. Every year, an estimate of 17 to 50 million devotees visit the Sabarimala temple. Located on a hilltop in Kerala, the temple is dedicated to the Hindu celibate deity Ayyappana, the son of Shiva and Mohini, and feminine incarnation of Vishnu. The temple has a unique way of functioning. Here, devotees are mostly men. Girls who have not yet attained puberty, and women who have reached menopause can visit too. However, before embarking on a journey to visit the temple, devotees must undertake the 40 days penance, including abstaining from worldly pleasures and wearing certain colours, such as black. 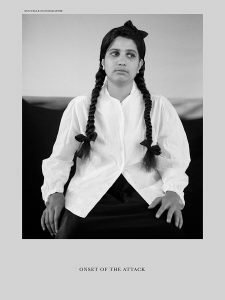 Despite the gender-related issues and its politicisation, Nandini Valli Muthiah’s series is meant purely as an anthropological study, and is not a socio-political comment. 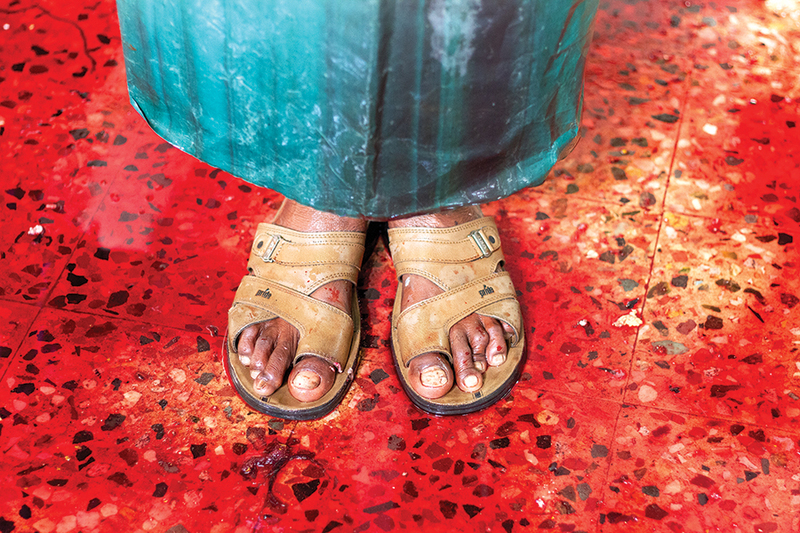 Her portraits offer a sensitive look at these devotees who are on the final leg of their journey to meet their God. Their clothing, articles of worship, offerings and mannerisms are insightful, especially if you consider that over a lakh of similarly clad devotees visit the shrine on a daily basis.